Whether you subscribe to blogs about motherhood, purchase parenting magazines and books on the regular, or engage in conversations with other moms and dads at school drop-off and pick-up, you’ve probably heard buzzwords like ‘positive discipline, ‘positive parenting’, and ‘natural and logical consequences’ floating around more and more lately. There are so many different ways to discipline your child, and while some still opt for more extreme disciplinary techniques like spanking, the silent treatment, and grounding children for extended periods of time, positive parenting techniques are designed to improve parent-child relationships, reduce power struggles, increase emotional intelligence, and encourage open and honest communication. Regardless of your preferred approach to parenting, teachers have been successfully using logical consequences to encourage appropriate behavior within classroom settings for years, and the results are too impressive to ignore. Criticize. Remember that the goal behind using consequences is to provide an opportunity for your child to learn from their mistakes, not lower their self-esteem. Blow things out of proportion. As you’ll see in this post, in order for consequences to be effective, they should be natural and logical. For example, implementing additional study time after school is a natural consequence when a child receives a bad grade on a test. Taking away his TV privileges for a month is not. Delay consequences. In order for consequences to be effective, they need to be implemented immediately after the undesirable behavior occurred. Ignore bad behavior. If your child is engaging in undesirable behavior that isn’t dangerous or harmful to himself or others, ignore it. Do not engage him and avoid eye contact until he stops the behavior in favor of something more acceptable, at which time you should offer praise and positive interaction. Use praise and rewards. Taking the time to point out and praise or reward your child when he behaves appropriately not only boosts his self-esteem, but it also teaches him what your expectations are and makes him more motivated to seek our desirable instead of undesirable behaviors. Be consistent and follow through. In order for consequences to work, you must resist the urge to intervene and always follow through. Natural and Logical Consequences: What’s the Difference? If your child refuses to eat, she’ll feel hungry. If your child fails to study for a test in a subject she struggles with, she’ll likely receive a low grade. If your child insists on going outside without wearing a coat, she’ll feel cold. If your child refuses to brush her teeth, she isn’t allowed to have dessert. If your child fails her math test, she’s required to spend more time studying after school. If your child refuses to pick up her toys after being asked, the toys are taken away for a certain period of time. While both kinds of consequences are effective, natural consequences don’t always occur as a result of poor behaviors, making logical consequences an effective behavioral strategy to understand and implement. As previously mentioned, the use of logical consequences to change a child’s behavior patterns fall within the ‘positive discipline’ framework, which is focused on remaining calm and respectful of children while enforcing proper rules of conduct. Now, that’s not to suggest poor behaviors are ignored. The idea is to establish reasonable limits for children, guide them in learning how to stay within these limits, and equip them with the tools they need to recognize and rectify their own behaviors when they fall off track. While the concept of using logical consequences as a form of positive discipline with your kids may sound simple in theory, coming up with creative consequences in the heat of the moment can be tough. When your child is being disrespectful, not listening to you, goofing off, fighting with her siblings, screaming, yelling, hitting, and testing your patience in every way possible, it can be difficult to keep your cool and remain rational. Be clear about rules and expectations. This is especially important in young children. By explaining what the rules are, what’s expected, and what is and isn’t appropriate, and taking the time to give your child regular reminders, you are setting her up for success. The easier the rules are, and the more consistently you reinforce them, the easier it is for your kids to meet your expectations. Take a Deep Breath. When your child is misbehaving and you feel your blood pressure starting to rise, take a deep breath, gain control of your emotions, and take inventory of where you are in that moment. Set a good example by refusing to let your child’s behavior upset you, and remember that her actions aren’t a reflection on you as a parent, but rather a normal part of a child growing up. Knowing this can help you to pull back, gain composure, and be proactive instead of reactive. Consider the reason for the behavior. Is your child tired, hungry, sick, upset, anxious? Have there been changes in your home recently that could cause her to feel extra stressed or emotional? 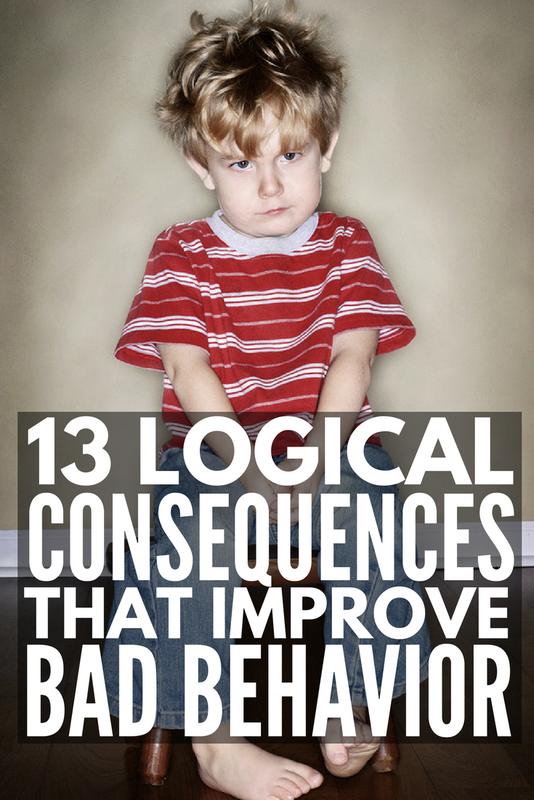 Figuring out the WHY behind your child’s behavior can be extremely eye-opening. Not only will it allow you to connect with and help your child better, but it will also enable you to be proactive and avoid a repeat experience in the future. Relevant. In order for your child to make a connection between the behavior and the consequence, it’s important that the 2 are tied closely together. For example, implementing additional study time after school when a child receives a bad grade on a test is a reasonable consequence that directly corresponds with the behavior you are trying to change. Taking away a child’s TV privileges for a month due to a poor grade is not. Realistic. Consequences should also be reasonable. In the example above, implementing an additional 30-60 minutes of homework each evening and/or hiring a tutor after receiving a bad grade is realistic, but taking away all of a child’s privileges and expecting her to spend 6 hours a night studying is over the top. Respectful. Logical consequences are designed to provide your child with an opportunity to learn from her mistakes, not lower her self-esteem. Use simple, concise, factual language and avoid negative emotion so as not to embarrass your child and make her feel defensive. Always follow through! As parents, we often hear about the importance of being consistent and following through with consequences. If you fail to follow through, your child won’t take you seriously, learn accountability, or figure out the difference between right and wrong. When it comes to implementing logical consequences, taking the time upfront to anticipate negative behaviors and brainstorm creative consequences that are relevant, realistic, and respectful can help you stay in control in the heat of the moment. Of course, every child is different, and what works for one family may not work for another, but here are 13 logical consequences to inspire you towards a more positive approach to parenting. Loss of privileges. This is an easy logical consequence to fall back on as it can be applied to so many different situations. If your child is throwing her toys or refusing to share with others, she loses the privilege of playing with them for the rest of the day. If your child throws a tantrum when you ask her to stop playing with her iPad, iPad time is reduced or removed for a period of time. If your child behaves badly during a playdate with her friends, the playdate is cut short and/or she’s not allowed to participate in a playdate the following weekend. Take a 10-minute break. When behavior gets out of control, a short break in which a child is quiet can help calm her down and help ground her. This doesn’t need to be as drastic as sending a child to her room or ordering her into a time out. Simply removing her from the activity she is participating in and asking her to sit quietly and read a book for 10 minutes can help restore a sense of calm without it feeling like a true form of punishment. Sometimes I like to turn it around and grant myself a 10-minute break when behaviors get out of hand! Additional household chores. If your child has a tendency to complain she’s bored or refuse to participate in activities, crafts, and games you organize on weekends and school holidays, a logical consequence would be to assign household chores (‘I’d like to do X, but if you don’t want to participate, the other option is to help me with Y.’). Removal of toys for a period of time. If your child constantly leaves her lying toys around the house, or refuses to clean her room when asked, put all toys that aren’t put away properly in a bin and take them away for an extended period of time. Time deducted from desirable tasks. If your child consistently argues with you about doing homework, dawdles in the morning, drags out her bedtime routine, etc., consider taking the additional time spent arguing about it away from more desirable tasks, like playing with friends and watching TV. Clean up your own messes. Have a child who enjoys making messes on purpose? Make her clean them up herself! You may have to go back and clean up properly when she’s not looking, but this logical consequence will make her realize her behavior isn’t as funny (or cute) as she originally thought. If you break it, you fix it. Kids love to play roughly with their toys, and sometimes they break them out of anger or frustration. It’s normal. But when you stop fixing their toys for them, they will soon learn to respect their belongings, and the belongings of others. Earlier bedtime. I love this logical consequence as I know firsthand that poor behavior is often a result of poor sleep habits. If this sounds familiar, consider moving up your child’s bedtime for each infraction throughout the day (i.e. for each tantrum your child throws, her bedtime is moved up by 15 minutes). Spend time with those they’ve hurt. If your kids exercise a healthy dose of sibling rivalry on the daily, or you learn your child has been mean to a classmate at school, a great logical consequence is to require them to spend more time with that person. This could mean a sleepover in their sibling’s room, a playdate with an ostracized classmate, etc. Ignore. When your child is talking out of turn, refuses to use manners, etc., don’t be afraid to ignore her until she starts speaking to you the way you expect. It may take some time for her to understand the reason you are doing this, and you may want to discuss this logical consequence beforehand, but it works like a charm! Enforce quiet time. If your child is yelling or speaking disrespectfully, a good (and peaceful!) logical consequence is to remove them from the situation for a bit of quiet time until they calm down and remember to use an indoor voice and appropriate language. Hands in your pocket! If your child struggles to keep her hands to herself, a great way to change her behavior is to require her to keep her hands in her pockets. You will need to provide an explanation about this logical consequence beforehand, especially if your child is prone to hitting, but it’s a great strategy to use in the moment to curb poor behavior. No work, no play. If your child refuses to do her chores, don’t be afraid to take away play time. Once your child makes the connection, she’ll act more appropriately. While logical consequences require foresight and involvement from parents, teachers, and caregivers, they are extremely effective in helping children replace poor behaviors with more appropriate choices when used correctly. Remember to be clear about rules and expectations, consider the reasons behind your child’s behavior, and use consequences that are relevant, realistic, and respectful. It’s important to keep in mind that logical consequences are designed to provide your child with an opportunity to learn from her mistakes, not lower her self-esteem. If you take the time to anticipate and plan ahead, you will be much better equipped to deal with behavioral challenges in a more positive and effective manner. If you found this post about the different ways to discipline your child and how to use logical consequences helpful, please share this post on Pinterest!